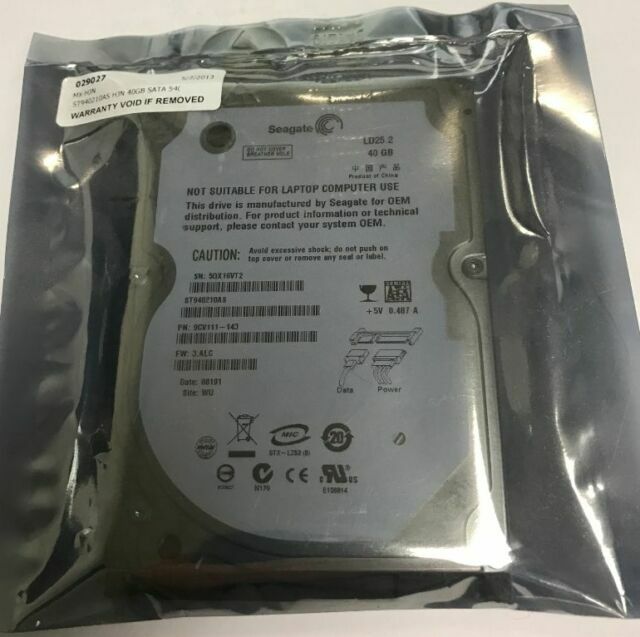 item 2 ST940210AS, 5QX, WU, PN 9CV111-143, FW 3.ALC, Seagate 40GB SATA 2.5 Hard Drive! -ST940210AS, 5QX, WU, PN 9CV111-143, FW 3.ALC, Seagate 40GB SATA 2.5 Hard Drive! This Seagate 40 GB hard drive is fast, sturdy, and designed for giving you plenty of spare storage capacity for the foreseeable future. Do-it-yourselfers and IT professionals can take pleasure in the quality and dependability of this Seagate 40 GB hard drive. The Seagate LD25.2 Series is a compelling solution for replacing your old hard drive. Store all your cherished shared videos, software applications, and large files with plenty of room to spare by making use of the generous storage capacity featured on this internal 2.5-inch hard drive. Thanks to a rugged design, the Seagate LD25.2 Series is wonderfully durable, so you can reap the benefits of long-lasting maintenance-free performance without worry of disk crashes or mechanical breakdowns. This Seagate 40 GB hard drive is a breeze to install, enabling you to promptly hook it up to systems that support SAS and Serial ATA interfaces. What's more, the Seagate LD25.2 Series has a fantastic 5400 RPM rotation speed, so you can backup tons of photos, MP3s, and data files in rapid fashion. The 2 MB buffer included with this internal 2.5-inch hard drive allows you to squeeze out impressive access times when loading software, downloading music, or copying files.